I’m always on the lookout for places where I can enjoy decent food in kid friendly surroundings, so when I spied the newly opened Vozovna Restaurant on a visit to Stromovka Park, I just had to return and try it out. One sunny long weekend David, baby Ari and I headed to Stromovka on the number 5 tram. Before leaving the house we had the unusual sight of this large white balloon with ribbons floating up and down one of our neighboring Zizkov streets. It turned out to be the star of an international Coca-Cola commercial - so if you see the ad you’ll know where it was filmed! Vozovna translates as Tram Depot and if you approach the restaurant from the main park entrance the path widens where tram tracks once ran right up and into this building. Most useful is a brand new playground which has a kids tram to climb aboard, surprisingly containing some musical instruments built in, as well as a zip line, climbing frames, swings and a whole host of other equipment sure to entertain. The building, for many years a neglected ruin, has been totally revamped. It takes advantage of it’s forest location and has ceiling to floor glass on three sides so you can appreciate the cool, green environment that surrounds. Inside the decor is minimal chic with plenty of tables, but on this warm day, everyone had found themselves a table outside. On one side of the building there are tables and chairs with umbrellas that overlook the playground. On the opposite side there are a few wooden bench tables which are nicely positioned underneath the trees and finally there is an outdoor area that is undercover, a good option for unpredictable weather - it was here that we chose to sit. When I first visited Vozovna, they had smoked trout dishes and several Croation specialities and the prices were incredibly low for Prague. Unfortunately the menu is now less ambitious and prices have risen but it is still very good value. They still serve a selection of baked potatoes with my favourite being the smoked salmon, dill and sour cream potato for 99 CZK. They also serve strawberry dumplings (which I love) and are quite rare to come across these days. Whats not to love about this place? Beautiful tree filled surroundings, a play area for kids far away from traffic and chaos and really fantastic food at great prices. Oh I nearly forgot to mention; the restaurant offers 4 kids meals for 49 CZK a dish. It’s also available for functions - it would be a lovely place for a party at night! Vozovna does not disappoint and is already popular with locals who drop by for a drink, coffee and cake or meal. Outdoor tables should be easy to come by but I’d recommend making a booking if you planed to come with a large group on the weekend and specifically wished to eat outdoors. DIRECTIONS: Easiest is to take tram numbers 5, 12, 14, 15, 17 or 91 to Vystaviste tram stop. By Car: There is paid parking at Vystaviste, alternatively there is metered parking up the hill in Nad Kralovskou Odborou ul. 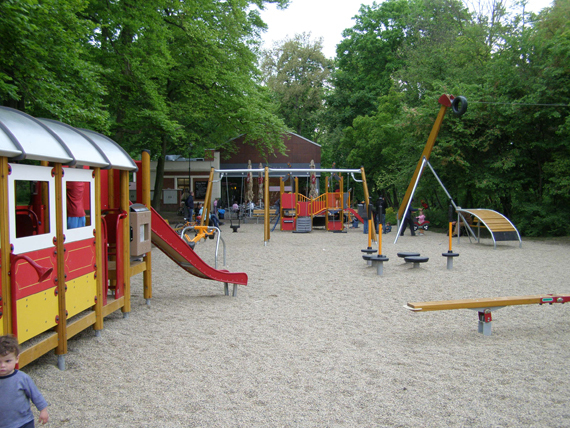 where you will also find the largest playground in Stromovka..